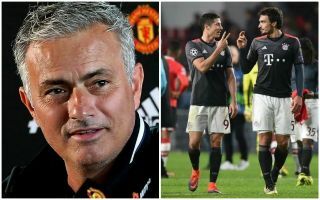 Manchester United manager Jose Mourinho may have been gifted the ideal solution to his side’s pursuit of the transfer of a new centre-back as Mats Hummels wants to leave Bayern Munich. This is according to Spanish outlet Don Balon, who list United as one of a number of top teams the Germany international is eager to discuss moves to after becoming unhappy with life at the Allianz Arena. Don Balon also list the likes of Paris Saint-Germain, Juventus and Real Madrid as options for Hummels, who is said in the piece as wanting a new challenge. Hummels has spent his entire career so far in German football and it is little surprise a top player such as himself might want to test himself in a more competitive league and show he can do the business elsewhere in Europe. United could certainly do with a defender of his quality, and it just remains to be seen if Mourinho would be prepared to take up the option of signing him. Mats Hummels to Manchester United? The Red Devils would surely see the 29-year-old as an upgrade on their current defensive options, with the club on a poor run of form at the moment after rotating between unconvincing players like Victor Lindelof and Eric Bailly at the back. Don Balon add that Real Madrid captain Sergio Ramos is not keen on a move for Hummels, so that may be one potential rival out of the picture.